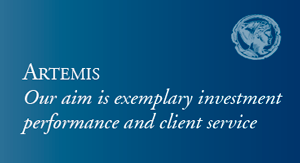 The focus of the artemus us smaller companies fund is really on good growth companies on by growth companies. We mean companies that are not entirely reliant on the economy for their top and bottom line growth. So one example would be our gym company, planet fitness. They have arrived at a really attractive concept, which is very cheap, cheap to run and cheap for consumers on. So that is really growing its top line about ten percent. Andi is very profitable, so it's not really reliant on levels of employment because for ten dollars a month, most people can afford that theater aspect of our positioning is to be positioned towards companies that arm or domestically focused. That's really partly because the global trade situation has become more complicated, given the current administration's attitude to trade eso. So, for instance, we did on her own a company that was importing goods from china and selling them in the us we have sold that because the cost of those goods that were important, i was going to start, start to rise and we thought impact their margins, said it's an example of some action we've taken recently to become even more domestically put that money into more domestic companies. We've made a number of recent changes on, really. Those are some companies in the in the correction the market is experience recently, onto performed a lot in share price terms but have continued to deliver very good earnings, so we've used that opportunity to add money to a number of those holdings. Because, frankly, you know, they've just become too super. The growth we believe is still there, and obviously we're questioning our own analysis and looking at the earnings on where we're confident that the growth is still there, we've increased our waiting's and some of those companies you're today. The profundities performed well. We have have been able to deliver quite a bit of al far extra performance to tour clients. More recently, it has struggled on a smaller companies have have underperformed the market that there's tended to be. A selling companies that have done very well year today, aziz said. We think that is probably relatively short term on offer right on the fundamentals of the companies. We only think that will continue to pay their dividends in the future as a starting point. We still like three fundamentals of the u. S. Economy. The tax cuts which we saw earlier in the year are not just a one year impact. We think it will have an impact through next year and going forward in terms of investment, for instance. And in terms of earnings growth, we still see strong earnings growth coming from from smaller companies. And the other factor we do after bear in mind is that interest rate policy in the us with interest rates going up means there's a strong dollar that tends to favor domestic companies. And again, our portfolio is position towards domestic companies in the smaller companies fund.